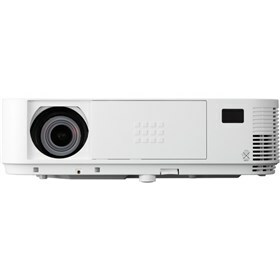 The NEC NP-M402H is 4000-lumen 0.65" DLP widescreen entry-level professional installation projector with dual HDMI inputs, powerful 20w speaker and ECO Mode™ technology. The projector has automatic keystone correction, cornerstone and geometric correction. It features advanced AccuBlend, AutoSense and built-in wall color correction. The NP-M402H also features filter free, closed captioning and virtual remote. It has variable audio-out, USB viewer and NaViSet Administrator 2. The projector is ideal for education and small-to-medium-sized business environments that need essential features, including bright images, automatic technologies and eco-friendly appeal. The NEC NP-M402H has many exciting features for users of all types. See the NEC NP-M402H gallery images above for more product views. The NEC NP-M402H is sold as a Brand New Unopened Item.